In the first bout of the season-opening home team double-header, High Rollers (HR) took their first win since 2017 against Guns N Rollers (GNR), a team that ended the 2018 season battling the Break Neck Betties for the home team championship. HR’s Polly Wanna Crack’er had a breakout performance with 86 points in the team’s 101-point win. HR’s off-season addition of Elicia Nisbet-Smith—co-captain of the world-champion Wheels of Justice and a mainstay of its blocker corps—helped shore up HR’s defense, which was able to limit last season’s top scorer, GNR’s Eve Anne Hellical, to 59 points. At the end of Jam 4, the game was tied 25 to 25, but then the HR went on a 59-6 scoring run over the next 6 jams. The scoring spree included 15 points from Polly in Jam 11 giving them a lead of 84-31. Even as GNR settled down, scoring was a hard-fought, back-and-forth battle. GNR managed to close the gap but HR skated into intermission in the lead with a score of 122-68. GNR’s return to the track at the start of the second half was rough: back-to-back jams with jammer penalties allowed HR to add to their lead. In the first 8 jams of the half, HR gained lead jammer 7 times, netting them 45 points. 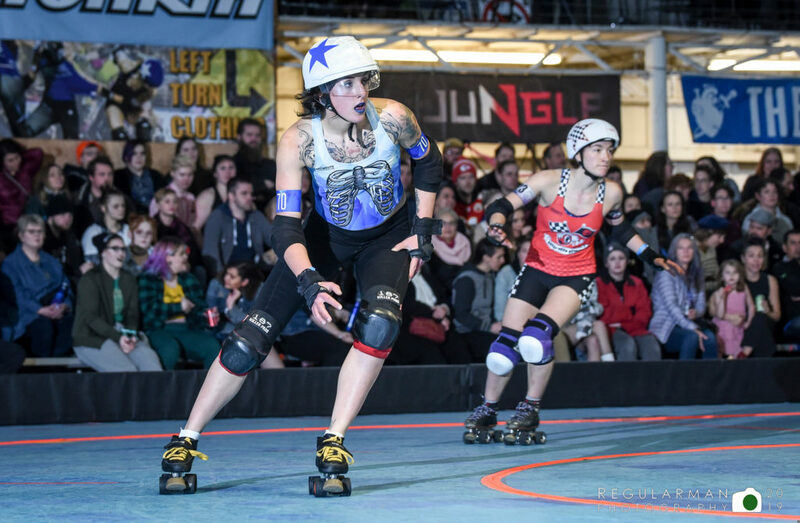 GNR never got closer than they were at the half since HR held strong with their defensive walls with Pixie, Shaolin Spocker, and Big Bang Fury, who was—until last year—a captain on the Rosebuds’ All-Star Travel Team. The crowd cheered newcomer jammer Lurz Lemon (HR) showing off her toe stop skills and speed in this, her first game with RCR; Lurz Lemon came to Rose City after skating in Pennsylvania since 2012, most recently with Brandywine Roller Derby.  The High Rollers expanded the lead they had at the half over the course of the second period and won the game 223-122. GNR had planned for the addition of Coperna Cuss and Licker-N-Split during the off season to help with their defense. Licker previously jammed for the Breakneck Betties and the Wheels of Justice. Cuss was back as well after suffering an injury last season. The two of them had strong returns, with Cuss’ efforts earning her MVP blocker for the game. Unfortunately, it was not enough to hold back the young HR jammer corps of Polly, Apocelyse, Lurz Lemon, and Nooga Knockout. Last season, the Break Neck Betties (BNB) and The Heartless Heathers (HH) each took a win from the other. In the kick-off to the 2019 season, the Betties took the win over the Heathers with a score of 239-186. Gal of Fray led the Betties in scoring with 81 points, an effort that earned her MVP honors as jammer for her team in the 53-point victory. 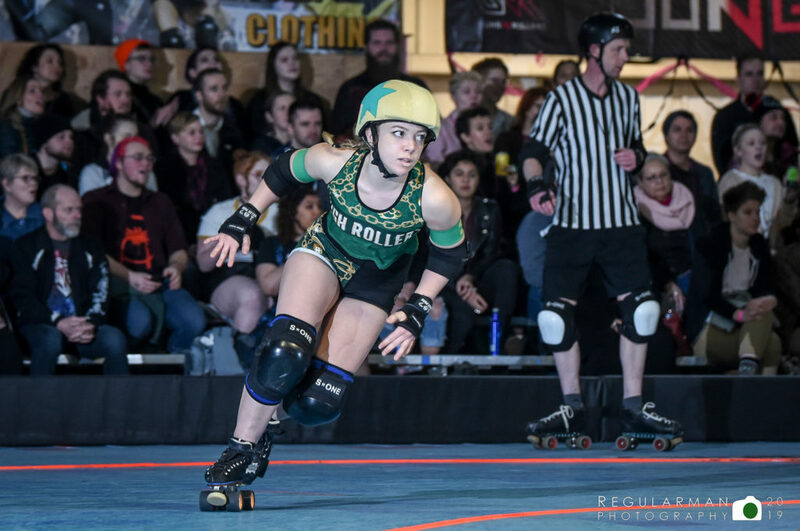 Freddie HerFury, who was drafted to the Rockets from the Rockets just last month; she started her skating career with the Silicon Valley Roller Girls in 2015, stepped in as a new Jammer for the Heathers, joining veterans Headache, Tegan N Scare-ya, and Mia Palau. Freddie’s skillful performance resulted in the Betties recognizing her as the Heathers’ MVP jammer in her first game with RCR. The Betties’ strong defense resulted in the Heathers’ jammers passing the star in four of the first seven jams to try to keep pace with the fast Betties’ jammers. Despite these efforts, the Heathers still found themselves down 44-17. From there, defenses on both sides got strong. Nacho Lucky Day and Bella Constrictor, who both returned to the Heathers after leaves of absence, made any points scored by the Betties’ jammers hard-fought. The Betties blockers, led by pivots Ripley and Tenacity, held the HH jammers to an average of less than 4 points per jam in the half. Ovarian Barbarian (BNB) was the top scorer in the half including 20-points in Jam 15. At the half, the Betties were leading 121-74. The second half started with each team having big jams as they traded points back and forth: Jam 2: 16-4 Heathers; Jam 3 11-0 Betties; Jam 4: 11-0 Betties; Jam 6: 11-4 Heathers; Jam 7: 12-0 Heathers; Jam 8: 13-4 Heathers. It appeared that the Heathers were coming back as they exploited some big penalties called against Betties skaters. Unfortunately, it was not enough. The Heathers got as close as 34 points. After a Betties’ team time-out with 6:00 left, Gal of Fray put up a 20-point jam. That was followed by a 16-point jam by Beyond Thunderdame, which made way for the Betties’ 239-186 victory.